Plectranthus 'Mona Lavender' which has glossy green leaves with the most amazing deep purple undersides. Every time I visit Gravetye Manor I pick up some new bit of information which feeds into my work as a garden designer. This week I was walking through one of the glasshouses with Steve and he was telling me more about what plants they grow there when we walked past this beauty (pictured). He delighted in pointing out the deep purple undersides of the glossy green leaves. Little details like this can really add something extra to a planting scheme, plus they're just fun things to notice. Plectranthus 'Mona Lavender' is a herbaceous perennial which grows to about 75cm in height and has sprays of lavender flowers. It was in the same cuttings glasshouse as the Salvias (sage) of which they grow many including 'Amistad', 'African Skies', 'Phyllis Fancy', 'Convertiflora', 'Curviflora' and 'Involucrata'. I didn't take any photos, but I can feel a dedicated Salvia post coming on at some point.. as they are such a (rightly) popular plant that just keeps on flowering. 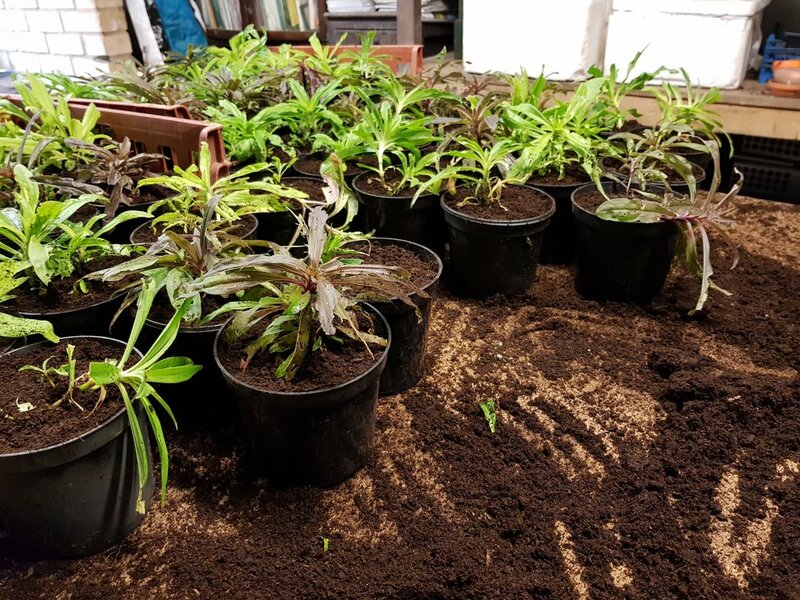 I spent a bit of time in the nursery doing a bit of pricking out of tiny seedlings into seed trays and potting on of more established plants into larger pots. This work is the backbone of the whole plant nursery operation as cuttings are taken from existing plants to create new ones. It is mindless, repetitive, calming work - but exactly what I needed after a week at my keyboard staring at a screen. And it was good to get my hands in the dirt as it always is. It was bloody freezing though, I had three pairs of socks on.